I do not belong to any political party. Had I been a US citizen in 2000, I probably would have voted for Bush. However, In the last few elections I have voted straight democratic candidates. I probably will not do the same in 2010. I have interviewed Sri JayaPrakash Narayan in March 2009. He strikes me as a well-read and has clear ideas on how to solve various complex issues faced by India and the State of Andhra Pradesh. Here is what he has to say about the recent mess on Telangana-united Andhra. With the Jan 5th Delhi talks on Telangana as the backdrop, traditional political ‘leaders’ of various regions have once again raised the curtains for more disruption, chaos and violence. Our top priority must be to restore peace, order, sanity and normalcy and create conditions for a healthy and negotiated settlement on the political crisis in the State. Last month, LSP had told Central leaders that Delhi, having taken a decision on Telangana, could not go back from its stand even as it could not ride roughshod over Andhra Pradesh by forcibly imposing its will. A just solution would emerge only when the interests and aspirations of people in all the regions were considered. It is obvious that there is no magic formula that can simultaneously accommodate the demands for the State’s division as also for keeping it intact. Any solution will involve a give and take on the part of all the stakeholders. The Government of India cannot be expected to backtrack on a stand it has already announced in public but at the same time it is in no position to impose its will on a major State in a federal setup by riding roughshod over public opinion. is different from its public agenda. Lok Satta Party we do not set our agendas going by the day’s newspaper headlines or hourly news bulletins on 24-hour news channels. True leadership lies in leading people and not being swayed by momentary passions. A political party, its leaders, members and representatives should behave like a compass and not as a weather-wane. At Lok Satta Party, we have made it clear on multiple occasions that we did not view the current agitations for and against Telangana as a fundamental issue. A threat to freedom or secularism could be a fundamental issue but the formation of Telangana or keeping the State united was just a political, administrative arrangement. It is true that people are swayed by sentiment on both sides. But a mature political party should not be swayed by agitations carried on by a vocal minority to whichever region it belonged to. It should reflect calmly on the repercussions of any stand it might take. Lok Satta has also pointed out that the Central and State Governments should turn the present the crisis into an opportunity to put an end to centralization of power. For instance, regional committees of legislators with full autonomy and powers to enforce existing arrangements like the six-point formula could be formed. The Government of India should come up with a package to address backwardness in different regions of the State. The people should realize that whether the State is divided or not all of us live in the same territory and speak the same language and have to coexist with mutual respect. LSP will not compromise on the interests of any region and will fight to ensure justice to everybody. 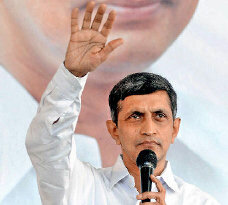 Lok Satta calls upon the youth and students to work together to change the nature of politics in Andhra Pradesh. Thanks to the chicanery, unbridled corruption and cynicism of major political parties millions of people have been leading miserable lives for decades. The Telangana issue has exposed the cynical flip-flops of major political parties. It is time that all like-minded persons who care deeply for the country, no matter in which party they happen to be, forged a new political force and transformed the State and the country.